Tasmania is renowned for it’s largely untouched landscapes and it’s countless national parks (nearly each one heritage listed). For those reasons alone, it’s only natural that a visit to the island state involves plenty of time exploring the outdoors! On our way from Hobart to Lake St Claire, we took a little detour and stopped at Mt Field National Park. A little over an hour outside of the city, Mt Field is a rather incredible place. After a quick, lovely chat with the staff in the visitors centre, we set off with a map in hand and a few thoughtful suggestions to help us make the most of our stop over. One of my favourite parts about this place, is that you don’t need to walk for hours to see the highlights – as we were limited on time, we were still able to catch some pretty incredible sights after just a short walk. Roughly a 25 minute return trip, gets you right in front of Russell Falls, with the path taking you on past Horseshoe Falls and then to the Tall Trees and back in just over an hour. The forest surrounding the designated paths was like something right out of a fairy tale, with furry green moss covering tree trunks and logs, large fern trees surrounding the waters edge and the sound of streams and creeks trickling along over rocks and dips in the banks. It took all I had not to get distracted as we made our way along the path – I could have spent a good couple of hours here taking in every sight, sound and texture, had we not been pressed for time. Most of our walk involved Christian stopping ahead realising he was walking alone, and calling out for me to catch up! 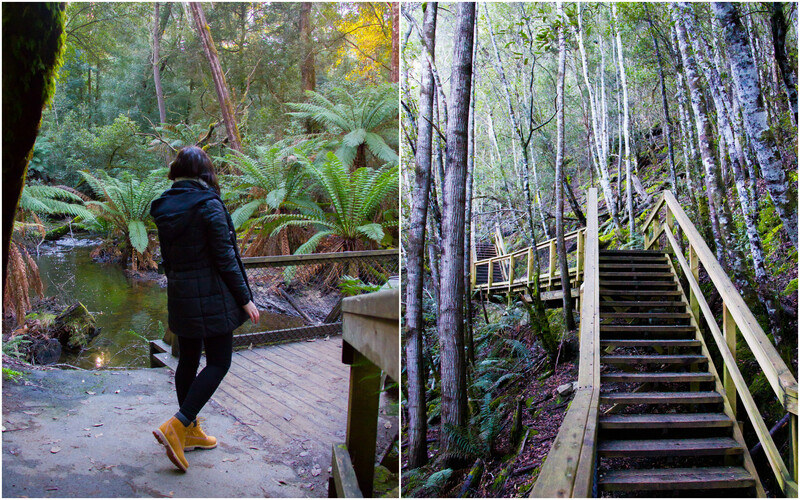 Walking past a mix of towering swamp gums (the tallest flowering plant on Earth) and fauna typical to wet forests and cool rainforests, the path follows around along creeks lined with tall ferns until you find yourself at Russell Falls (you’ll hear them before you see them). The falls may not be the largest you’ll see but they’re still quite commanding, and we found ourselves in front of them completely mesmerised by both the sound and the cascading shelves of water while the surrounding vegetation swayed about in the spray. If you take the walk at night, glow worms can be seen amongst the trees and shrub approaching the falls (just be sure to turn off all torches in order to spot them – the hand rails will help guide you on in the dark). Continuing on past Russell Falls, the climb higher begins. There’s an additional viewing platform looking out over the falls, before a further ascent on to Horseshoe Falls. Although a steep climb, it’s a short one and Horseshoe Falls are a real treat for your efforts! 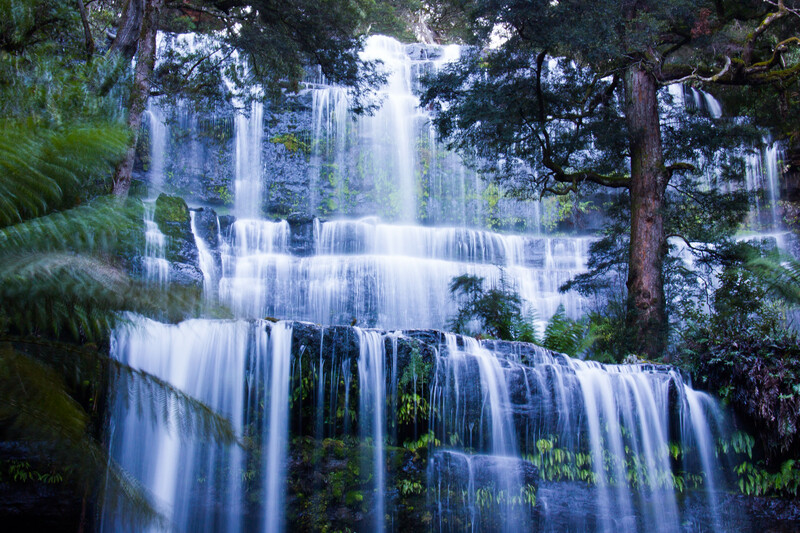 Despite being much smaller than Russell Falls, these are found in such a beautiful setting they’re becoming perhaps more photographed and recognised part of the National Park. If you’re up for a decent trek, you can carry on again towards the Tall Trees circuit. 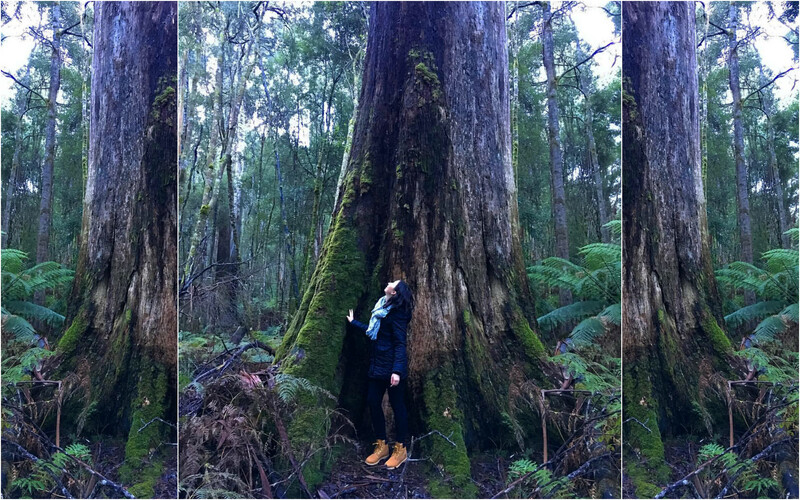 These swamp gums are amongst the tallest trees in Australia, and this walk gives you plenty of time to admire them and take it all in. Some of these beautiful trees are 60-70 metres tall! This part of the walk leaves you feeling dwarfed, as the canopy above lifts higher and you have to try your best not to fall backwards when trying to spot the top branches! 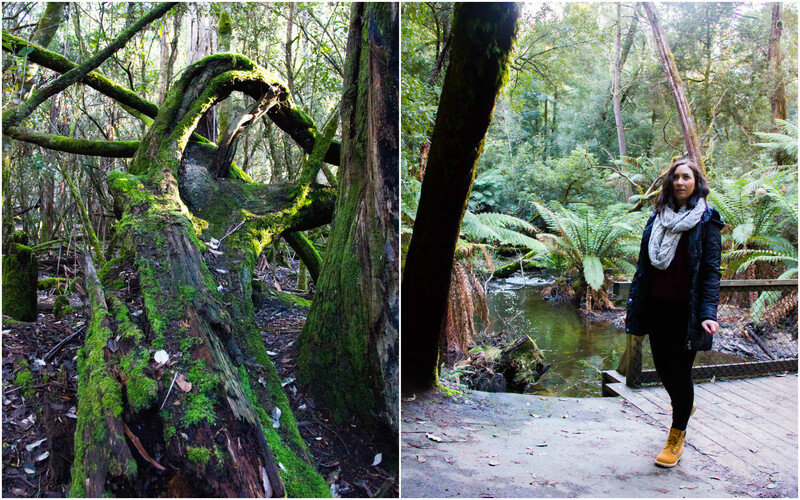 Another short walk worth mentioning, the Pandani Grove walk around Lake Dobson is the perfect place to spot some of the parks alpine species – with a bit of patience, and some luck, you might even catch a glimpse of a platypus in the lake! Early mornings and late evenings are the best times to be on the lookout for these illusive little creatures. Keep in mind, that as this walk (40 minute circuit) is in the high country, be prepared for cold and wet weather. Some important things to remember when visiting any of Tasmania’s beautiful national parks – plan ahead and prepare, dispose of waste (take any rubbish with you until you can find a bin), leave what you find (this includes plants, rocks and other natural objects), respect the wildlife (keep wildlife wild! Feeding animals can not only turn them into pests but also make them quite sick) and last of all be considerate (respect other visitors and your wonderful hosts). ACCOMMODATION – There’s one campground catering for vehicle-based campers (no tents folks!) with barbecues, shower block and both powered and unpowered sites. There are also five accommodation huts located in the alpine area of the park and can be accessed in most conditions, however visitors should be prepared for snow in winter and spring. These huts are basic with running water, wood heater and bunks, so go prepared for camping! Booking are essential, so contact the Visitor Centre on the number above. That photo of the waterfall is amazing! 🙂 I’d love to stop by there one day.